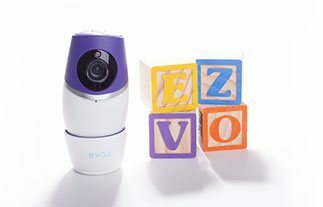 Jessica Gleim, Evoz Director of Marketing and ever-more-experienced mom, talks about how her Evoz WiFi Baby Monitor has become part of the family. 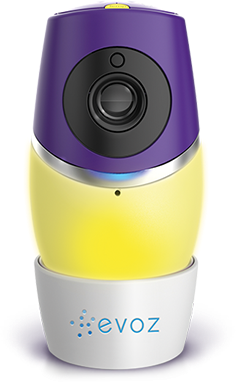 Real cry detection sets Evoz apart from all the other baby monitors on the market – but it’s not always easy to understand what that means until you’re actually using it. 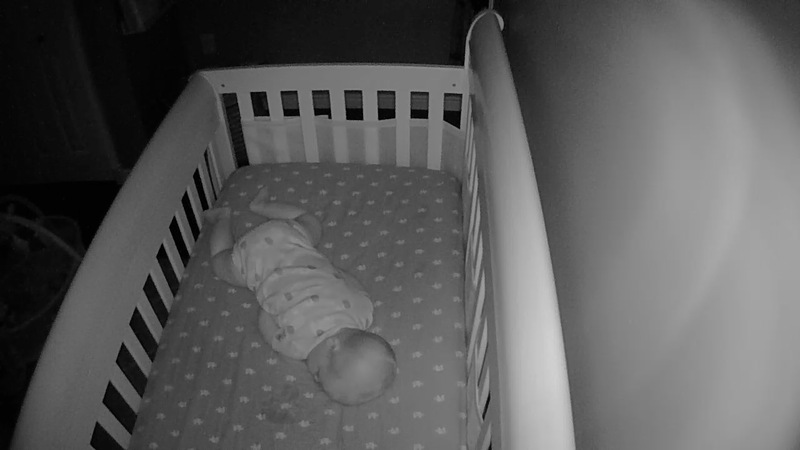 I tried other monitors that claimed to have “cry alerts,” but they went off without rhyme or reason – even when baby was sleeping soundly and wasn’t a bit bothered, or sometimes when he wasn’t even in the crib! The truth is, I don’t absolutely need a baby monitor at my house. Our house isn’t big, it’s all on one level, and my baby has a good set of lungs. I’ll definitely hear him crying when he wakes up and needs me! So I don’t need to have constant video and audio streaming. What the Evoz cry alerts give me is additional peace of mind that lets me really focus on my work while he’s napping. I know that even if I don’t hear him right away, or if I step away for a minute (like to grab the mail, chat with my neighbor, or let the dog out), the monitor will notify me. 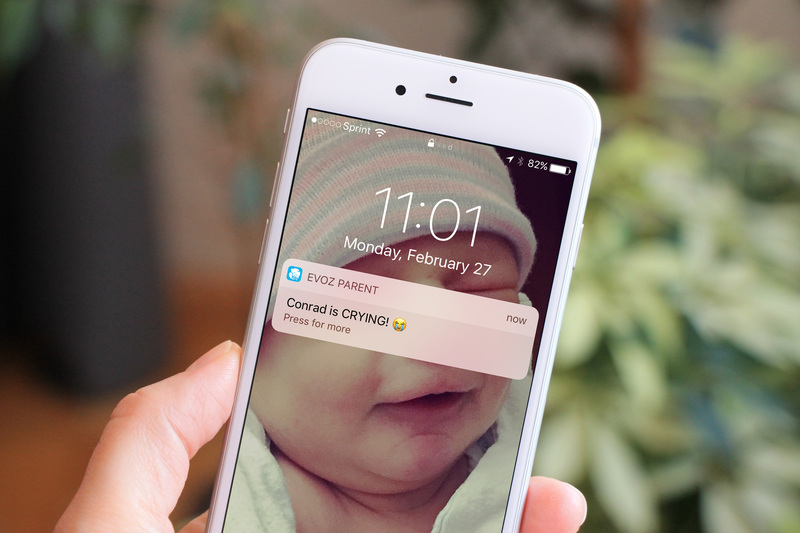 The cry alerts even enable remote parenting! My husband likes to get the alerts on his phone at work because he knows that when he gets them, it means baby is in the crib and he can peek in on him. One time I had just put the baby down and, knowing he needed to fuss for a while before he put himself to sleep (learning to self-soothe at his age is so important, more on that below), was ignoring the alerts on my phone. Until I got a text from my husband: baby’s leg was stuck out the side of the crib! I went in and saved him from the uncomfortable position he’d wiggled himself into, and he went right to sleep. My parents travel a lot but they still love to keep in touch. (Of course my mom wants to show off her precious grandchild to all her friends!) I’ll text her to say Conrad is in his crib and she’ll open the app on her own phone to check on him. Sometimes I get texts from her at bedtime when we’re running behind for some reason. “Why is he not asleep yet?” Once a mom, always a mom! I’ve been super lucky to work with our resident sleep expert Kim West LCSW-C, The Sleep Lady®. I am 100% sure that without her insights and reassurance, we’d be a far more sleep-deprived family! The idea that babies can and should learn to soothe themselves to sleep was a huge one for us. The fact that we could open the Evoz Baby app right on our phones to check in on him any time helped us let that happen naturally. When I hear him fuss, I don’t rush right into his room and wake him up. Instead I just check the app to assess the situation. Often he’s not in any real distress at all (his eyes are usually shut!) and calms right back down. This has been fantastic for my husband too. He works out of the house, so he’s only home with baby for that short period of time after work and before bed. 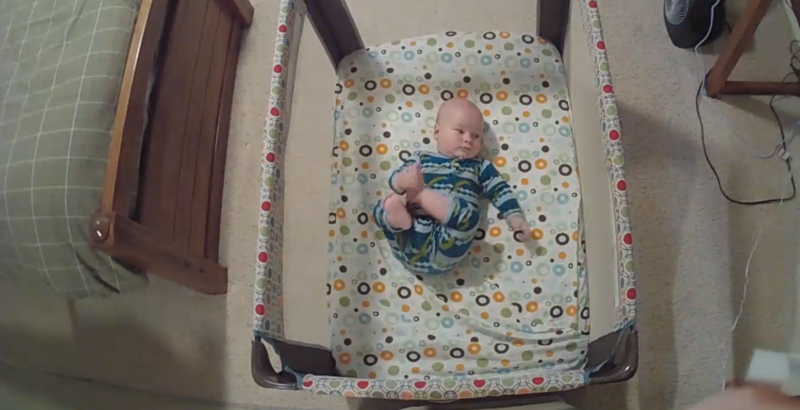 He LOVES watching the Evoz app after we put the baby to bed, and watching him fall asleep. It’s part of dad’s nightly routine and I know it helps him feel connected to our little guy. When we visit my parents or friends, I always take along the travel crib and our Evoz monitor. It’s super convenient that you only have to enter the WiFi information for a new network once. After that it reconnects every time I plug it in (just like my iPhone!). My parents’ house is much larger than mine and my baby naps in a totally different wing of the house, so the monitor especially gets a lot of use when we’re visiting them. I said this before, but really, I had no idea how awesome Evoz’s snapshot feature would turn out to be! Even now, my baby still spends half his day sleeping. I love love love capturing his sleep milestones. And there are those funny moments when it turns out my “sleeping” baby is up to something completely different! I print out my favorite photos each month and put them in his baby book. I loved that he recently decided to nap in the opposite direction! When I first brought baby home, I had no idea what I’d need and what I wouldn’t! We used so many of those “must-have” baby products just a handful of times… But our Evoz monitor definitely isn’t just another gadget. We’ve used it daily since baby was born, and it doesn’t look like we’re going to stop any time soon. Can we use device to monitor older parents from another home?